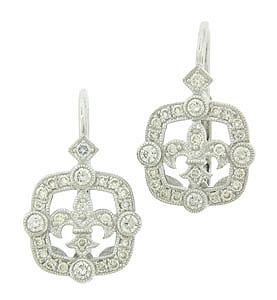 Fashioned of 14K white gold, these antique style earrings feature a diamond frosted fleur de lis figure framed in round cut diamonds. The earrings are finished with European backs. The antique style earrings measure 3/4" in length, 1/2" wide.